The API provides a geocoding service, which can determine an object's geographical coordinates based on its name (forward geocoding), or the opposite, find an object's name based on its coordinates (reverse geocoding). Both types of geocoding (forward and reverse) are performed using the geocode function, which can be passed an object name as a string, or coordinates as an array. 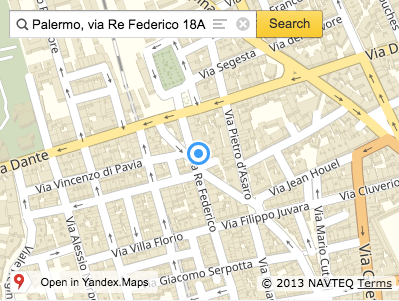 The geocode function is asynchronous, meaning that data is exchanged with the server while it is being executed. Asynchronous interaction is implemented using promises. Invoking the geocode function causes immediate creation of a vow.Promise type object, which performs the set functions when either geocoding results or an error message are returned from the server. The result of the geocode function is passed to the callback function as a GeoObjectCollection collection. This object implements the IGeoObject interface, meaning it can be placed on the map. Geocoding results are passed to the callback function either as a GeoObjectCollection collection (by default) or in JSON format. The format of returned data is set in the json option (true/false). For more information about the format of returned data, see Search on the map. The search can be performed across the entire world map, or in a specified bounding box. However, a bounding box might not strictly restrict the search. This means the search will be performed across the entire map, but the closer a found object is to the center of the bbox, the higher it will be ranked in the results. For reverse geocoding, the type of object to find can be specified (such as building, street, neighborhood, town, or metro station). Found objects are ranked based on their distance from the set point. When searching for streets, neighborhoods/regions, or cities/towns, their respective buildings are not included, regardless of size. // gives the coordinates of building 10 on Noviy Arbat street. 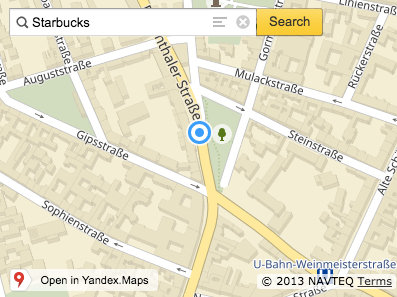 The “Search on map” control gives users the ability to search for desired objects on the map. 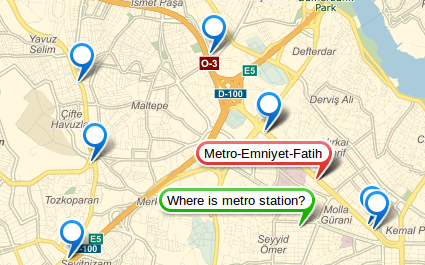 When a user enters a query in the search box, the API automatically performs a search and then displays the results on the map. Users can search for objects either by address or by geographical coordinates. In addition, this control can be used to search for businesses. // Creating the “Search on map” control. // Search will be performed across toponyms and businesses. // Adding the control to the map. Note. To make it possible to search for businesses as well as toponyms, pass the provider: 'yandex#search' option to the control.SearchControl class. To programmatically perform a search for some object, call the search() function. The search for objects will be performed within the current bounding box. A method that returns an object found at the specified index. The method works asynchronously. It returns a Promise object that is resolved by the found object or rejected with an error. // The search will be performed across toponyms and businesses. Returns an array containing all current results. // Subscribing to the search result selection event. // Getting the results array. // Index of the selected object. // Getting the coordinates of the selected object. Returns the number of results found. // Subscribing to the event of getting search results from the server. Displays the result on the map. // and the query has at least one result found. // for example, by clicking a button. All the available methods are listed in the reference guide. You can look at the example of using control.SearchControl in the sandbox.